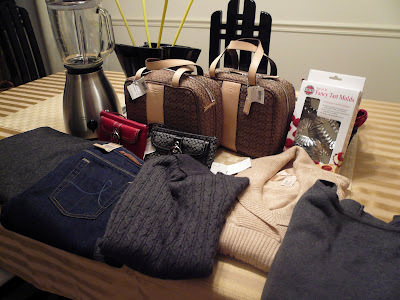 Snippets of My Life: Black Friday Shopping!!! After the cooking, turkey dinner, washing and cleaning up I was dead tired. I was not too keen of going to the outlet shopping at midnight anymore but since my neighbor Nancy is driving so we just tag along. The drive there was really smooth but traffic was bad at the parking area. More cars than parking space but we were so lucky to be able to find a spot after circling the parking lots a few times. The outlets was so crowded with young college kids. I guess they became hyper after the heavy turkey dinner and need to shop it off. First stop, Polo. I took a few items but the line at the cashier was so long and decided to put the items back and walk out. The next stop, Coach. There was a long line just to get into the store. Diana decided to wait in line while I went shopping at Le Gourmet Chef for some kitchen items. As usual came out with some baking pans because all items at 50% discount. Pretty good bargain. We bought 2 bags and 2 wristlets at Coach. The handbags at a discount of 40% and an extra 10% for shopping before 5.00am. Not a bad bargain. 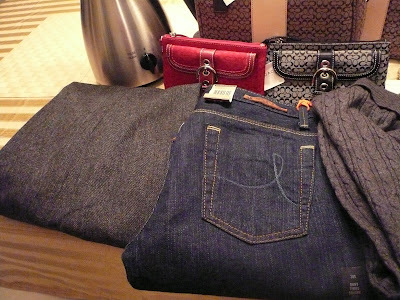 We then went to Gap and Banana Republic but we didn’t get to buy anything because of the long lines again. We decided we had enough of the crowd and went home around 2.30am. By the way, Carlos slept through all the shopping frenzy and he only start his shopping at 6.00am while I get my beauty sleep. We decided to go back there to the outlets again in the afternoon. This time it was not so crowded and we managed to buy what we wanted. 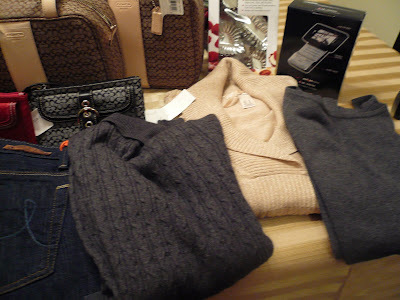 Overall, the shopping was alright. Will I do it again next year? No way…too much hassle with the parking, people and waiting in line. 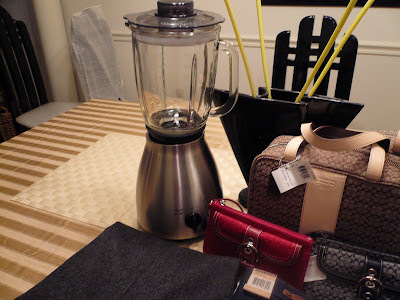 Next year, I will shop at a more decent time. 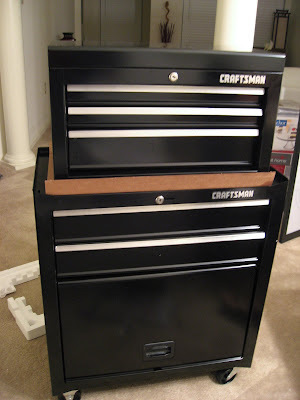 Carlos bought this tool box for himself. wah...Gert you buy alots man! !I see in TV, NY Woodbury Premium Outlet was jam from 3 am bumper to bumper.I was so afraid with long line & Mishu tagging along is really a pain.My nearest Premium outlet just 30 minutes away,but still ...so just shop near by.I love Carlos new TOOL box!! Gert, I SO jealous you managed to get Coach 50% off!! Over here, aku takut to even go near the malls cos people were sleeping in their cars the night before.... but 50% off, may just have been worth it! 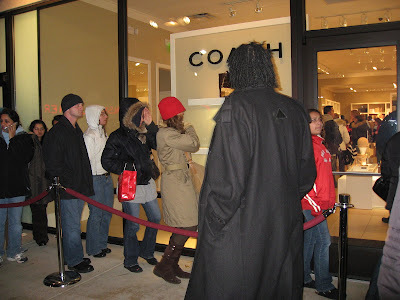 50% off Coach?! I saw that familiar-looking red wristlet! Looks like it someone couldn't resist the colour red anymore! Gert, you surely know how to shop! Good job! Those handbags looks great. So, you don't have to wrap for xmas? Pandai Carlos bought for himself something he likes. I pun suruh Murphy beli hadiah sendiri. Gert, is all that coach bags for yourself?? 50% discount is very good. I've a friend who get staff discount for 40% and yet never bother getting myself one. I'm the type tat will only buy bag when the old one is koyak. Must learn to collect like you. JOAT, don't learn too much from me :) :) you will get addicted to hangbags :) :)Wow, your friend can buy Coach for 40% discount. That is really good. You should take advantage of it :) Wish I can get a40% discount each time I buy a Coach. I cant believe u went to the mid-night shopping. i teringin jugak nak pergi but as u said it urself, too much hassle. 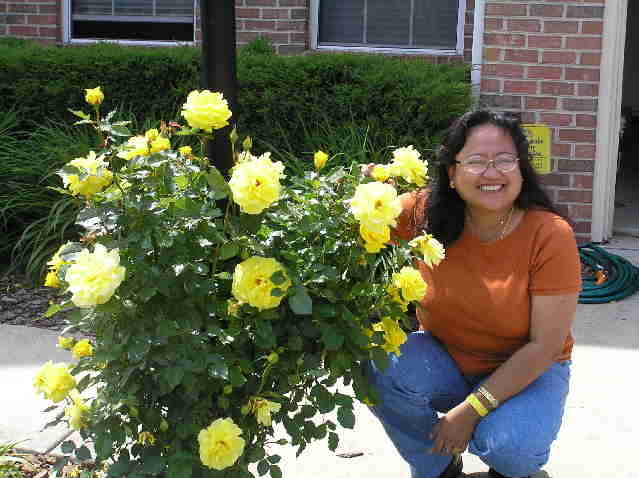 Hi Gert, thanks for your warm welcome on my new blog! Yes I am from MyB, that's how I started reading your gang's blog la, my user name on MyB is Saphrodites. WOW! what a busy day huh... I didn't go shopping for black friday this year. Feel bad to wake my son up early in the morning LOL. Anyway I just realize you live in PA. I live in Erie. Is this factory outlet mall in cranberry that you went shopping? Dwiana, we moved here 2 years ago from Irvine CA. By the way, where is Erie? I am in Chester County and the outlet we went is at Lancaster. It is far from your place? We live in Toronto and for the 1st time ever, decided to drive to the outlet mall in Buffalo, NY for the Thanksgiving midnite sale. It was, like u said, crazy busy! I just couldn't make myself stand in line. I did have to buy something so that customs at the border won't get suspicious if I have nothing to declare! So, I bought sox and a fridge magnet! Sad, huh? 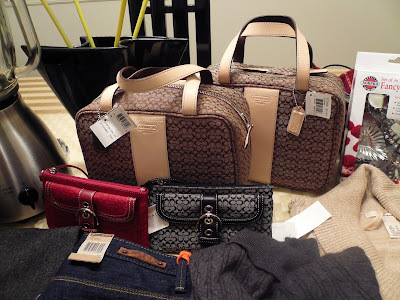 I love cross-border shopping but never again like this! Btw, love your Coach purses!